Welcome to week seven of our Centennial Concert Season. Our Concert Sponsors for the evening are the Carole and Hans Madland. Our Arts Partner, the Winona Brass Band, will demonstrate some unusual brass instruments. You can learn more about our guest soloist by visiting this link: Ashley Hall. Tonight’s sponsors, Carole and Hans Madland, live just across the park and enjoy the band concerts from their back porch all summer long. The summertime music is something they look forward to sharing with friends and family, so they were eager to help support the band and to celebrate its anniversary. Not born and raised in this wonderful town and having lived overseas and in many different places in our country, they know what a truly special place this is. They would like to dedicate tonight’s concert to Carole’s father, John Lontz, who loved band music. He was a devoted father and grandfather. He would be pleased to be here. He made everything possible. He is remembered. “Music can take us from our worries and sorrows, so let the joyful sound of the band lift our spirits,” say the Madlands. The Winona Brass Band is a volunteer amateur group and was established in 1993 as the result of a conversation between Denis Carter and Kevin Ryan. After the first few sight-reading rehearsals, they quickly settled in on the standard British brass band instrumentation under the direction of Dr. Janet Heukeshoven. The “Big River Brass Band,” as it was known then, presented its premiere performance in December of 1993 to an enthusiastic audience at St. Cecilia Theater. 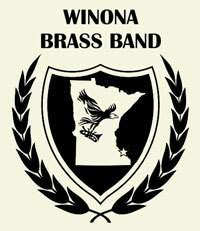 The band changed its name to the Winona Brass Band in 1995 to reflect the hometown of the band. Dr. Richard Lindner served as conductor from 2000 to the spring of 2015, and Dave Gudmastad will take over this fall. In 2007, the band was honored to play for the unveiling ceremony of the Minnesota State postage stamp commemorating the sesquicentennial of Minnesota’s statehood. The band routinely performs three regular concerts per year and has made regular guest appearances in the Chatfield’s “Music in the Park” summer concert series and the Rushford Society for the Arts’ concert series. The Winona Brass Band has performed at various venues in the past including the Grand Celebration of Brass Bands in Usher’s Ferry, Iowa; Caledonia Founders Day; Festival of Brass Bands in Cedar Rapids, Iowa; Rushford Town Homecoming; La Crosse Riverfest; Trempealeau Hotel; Winona’s Victorian Fair Revue; Central United Methodist Church of Winona; St. Stanislaus Kostka Catholic Church of Winona; Pleasant Valley Church of Winona; Faith Lutheran Church of Winona; the Chapel of St. Mary of the Angels in Winona; Winona Steamboat Days; Nordic Fest in Decorah, IA; and the National Brass Band Association contest. Learn more by visiting their Facebook Page: Winona Brass Band. I enjoyed reading the history of the bandshell and related articles. No where on this page or the City of Winona’s page does it tell what time the concerts start– important information for visitors.